Providing Interiors & Exteriors Finishes - Apartment Complexes - General Contractors - Property Managers - Home Owners Call for a free estimate! Referrals given upon request. 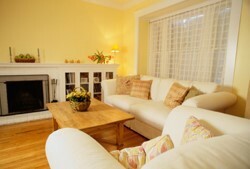 - Cover carpets, floors, furniture, fixtures, etc. - Patch nail holes and minor damage - Caulk cracks - Sand patched areas where needed - Prime patched and caulked areas - Apply spot texture as needed Give free estimates for drywall repair, wallpaper and adhesive removal, acoustic ceiling removal, new acoustic shooting or texture application, as well as for baseboard replacement. - Trench ground area at foundation if necessary. - Wash the home / building with a high-pressure water blaster. - Power wash to remove dust, dirt and insect nests. - Scrape loose paint. Rust is removed with a wire brush or disc sander. - Patch holes and minor damage. - Caulk cracks and stationary joint seams. - Remove and replace old putty around windows as needed. - Sand patch areas where needed. - Prime bare and patched areas where needed. - We will apply a full coat of primer to all wood surfaces to be painted. - Repair cracked or damaged stucco.